Dondo Yaki, also called Dondon Yaki, takes place either on January 15 or 16 throughout Japan. It's a Lunar New Year's event to pray for good fortune and a bountiful harvest by collecting and burning the ornaments that decorated houses during the New Year such as Kadomatsu or pine boughs, Shimenawa or sacred rice-straw ropes, and other charms. 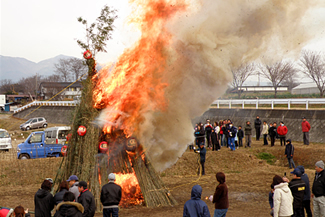 People have long believed local lore associated with this fire festival. Here are two examples. You don't catch a cold if you get near the fire or eat rice cakes roasted by the fire. Your calligraphic skills will improve if your first writing of the New Year goes up high in the air after you threw it in the fire. People bring their old Daruma dolls from the past year and burn them for consolation. A Mikoshi or portable shrine will be carried around town accompanied by drummers. Approx. 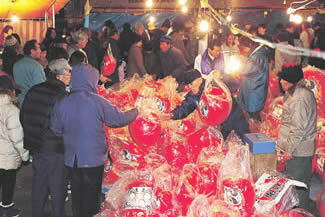 1,500 Daruma doll stalls will be placed alongside the Route 50 in Honmachi that draws hundreds of shoppers every year. Known as the first Daruma doll sale of the New Year at Shorinzan Darumaji Temple, where the Daruma dolls were born, this is an annual event that regularly attract 210,000 people. More than 200 stalls, mainly for Daruma dolls, will be placed at Isesaki Hatsuichi. As part of the Hatsuichi festivities, Joshu Yakimansai or Gunma Yakimanju Festival will be held at Isesaki Shrine. This is a Shinto ritual, in which four very large yakimanju, 55cm in diameter, will be roasted and offered. At a separate venue, there is another yakimanju event, in which the first 250 people will get to roast yakimanju with sweet bean paste themselves. The festival takes the visitors into the fantasy world of snow and ice. It offers truly a variety of events associated with snow, ice, and winter sports you can think of. Enjoy the winter wonderland in Tsumagoi. The 2-day festival offers a plenty of fun events, both for children and grownups. 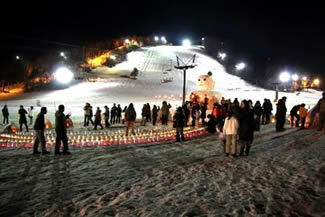 Click the address below to open the list of ski resorts in Gunma in PDF file.